This article focuses on the oaths of a midwife. A basic written source giving us information about solemn oaths of midwives which remained unpublished, was found in register no. 5 of Pchery parish district in the State Regional Archives in Prague (Central Bohemia). 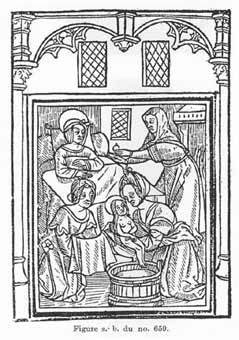 It comes from 1766 and is testimony that the function of midwife fused elements of spiritual and medical care. The oath deals with questions of ethics in medical as well as religious dimension. Thus, the position of midwife had to balance between real care and informing. A midwife had to take a solemn vow when entering her practice. The basic oath had eight points or paragraphs. In the fifth point, a midwife promised not to advise other midwives to do anything that could harm a mother or fetus. The literal wording of baptism in extremis is the sixth paragraph; thus vowed, the midwife also promised to baptize children. According to the seventh paragraph, anything extraordinary or dangerous was to be reported to the local priest. The eighth paragraph required a midwife’s promise to devote all her skills to protect mother and fetus from any neglect and lack of care. A midwife confessed to being informed that in case she caused the death of a mother or fetus by her own ignorance she would be forever damned.